O R I G I NAT I O N S E R V I C I N G A NA LY T I C S S E C O N DA R Y M A R K E T ANALYTICS 50 | TH E M R EP O RT THE LATEST Home Prices Continue to Climb Across Most Metros in Q3 The national median existing single–family home price in the third quarter was $229,000, up 5.5 percent from the third quarter of 2014. 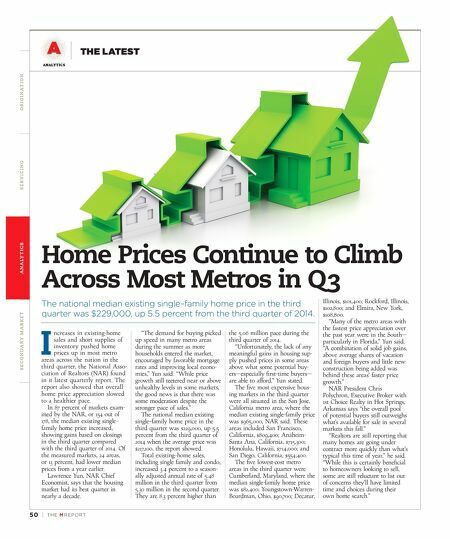 I ncreases in existing-home sales and short supplies of inventory pushed home prices up in most metro areas across the nation in the third quarter, the National Asso - ciation of Realtors (NAR) found in it latest quarterly report. The report also showed that overall home price appreciation slowed to a healthier pace. In 87 percent of markets exam - ined by the NAR, or 154 out of 178, the median existing single– family home price increased, showing gains based on closings in the third quarter compared with the third quarter of 2014. Of the measured markets, 24 areas, or 13 percent, had lower median prices from a year earlier. Lawrence Yun, NAR Chief Economist, says that the housing market had its best quarter in nearly a decade. "The demand for buying picked up speed in many metro areas during the summer as more households entered the market, encouraged by favorable mortgage rates and improving local econo - mies," Yun said. "While price growth still teetered near or above unhealthy levels in some markets, the good news is that there was some moderation despite the stronger pace of sales." The national median existing single–family home price in the third quarter was $229,000, up 5.5 percent from the third quarter of 2014 when the average price was $217,100, the report showed. Total existing–home sales, including single family and condo, increased 3.4 percent to a season- ally adjusted annual rate of 5.48 million in the third quarter from 5.30 million in the second quarter. They are 8.3 percent higher than the 5.06 million pace during the third quarter of 2014. "Unfortunately, the lack of any meaningful gains in housing sup- ply pushed prices in some areas above what some potential buy- ers—especially first–time buyers— are able to afford," Yun stated. The five most expensive hous- ing markets in the third quarter were all situated in the San Jose, California metro area, where the median existing single-family price was $965,000, NAR said. These areas included San Francisco, California, $809,400; Anaheim- Santa Ana, California, $715,300; Honolulu, Hawaii, $714,000; and San Diego, California, $554,400. The five lowest-cost metro areas in the third quarter were Cumberland, Maryland, where the median single-family home price was $82,400; Youngstown-Warren- Boardman, Ohio, $90,700; Decatur, Illinois, $101,400; Rockford, Illinois, $102,800; and Elmira, New York, $108,800. "Many of the metro areas with the fastest price appreciation over the past year were in the South— particularly in Florida," Yun said. "A combination of solid job gains, above average shares of vacation and foreign buyers and little new construction being added was behind these areas' faster price growth." NAR President Chris Polychron, Executive Broker with 1st Choice Realty in Hot Springs, Arkansas says "the overall pool of potential buyers still outweighs what's available for sale in several markets this fall." 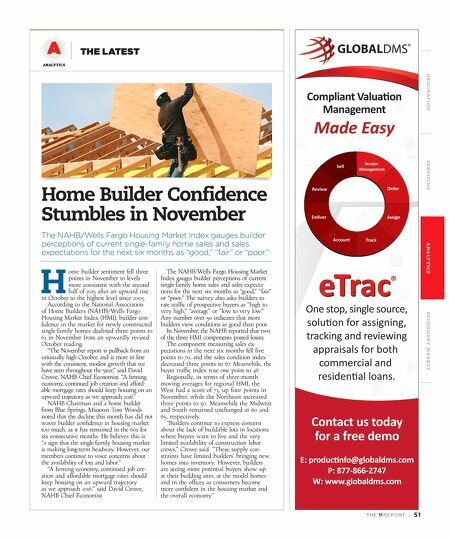 "Realtors are still reporting that many homes are going under contract more quickly than what's typical this time of year," he said. "While this is certainly beneficial to homeowners looking to sell, some are still reluctant to list out of concerns they'll have limited time and choices during their own home search."